Made of "rust free" galvanized steel, the serrano is an elegant way to display a home address. These low-voltage fixtures ( 18 Volts) have LED bulbs which are brighter and will last for years and are visible at over 100 feet away. The serrano provides fast and accurate address identification for guests, deliveries and emergency vehicles. 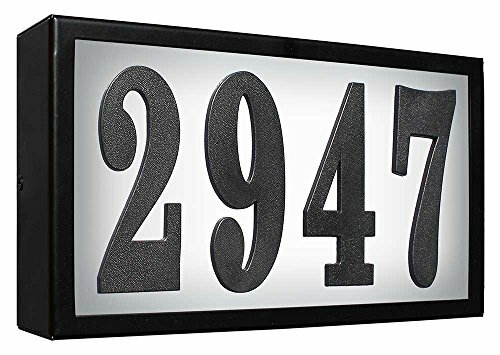 Plaque comes with Black polymer raised numbers 0-9 twice, a set of LED bulbs, 10 feet of low voltage wiring and tube of adhesive glue . If more numbers are needed please contact the manufacturer: Qualarc. Can be installed into your existing doorbell transformer or purchase one of our transformers jbx-15951 to hardwire or fps-2018 to plug in. Dimensions: 10-1/2" x 5-1/2" x 2"
If you have any questions about this product by Qualarc, contact us by completing and submitting the form below. If you are looking for a specif part number, please include it with your message.